Either a lot of people are throwing away hot charcoal at very odd hours or someone's setting trash cans on fire again. The latest spree of alley fires is popping up in nearby Lincoln Park. One trash can burst into flames at 4:40 Thursday morning near Clark and Wrightwood. Even more improbably, another fire broke out behind Juno sushi restaurant, 2638 N. Lincoln at 6:30 Thursday morning. We say that's more improbable because Juno sushi almost burned to the ground in a fire early last year. Neither fire has been classified suspicious by police or fire. 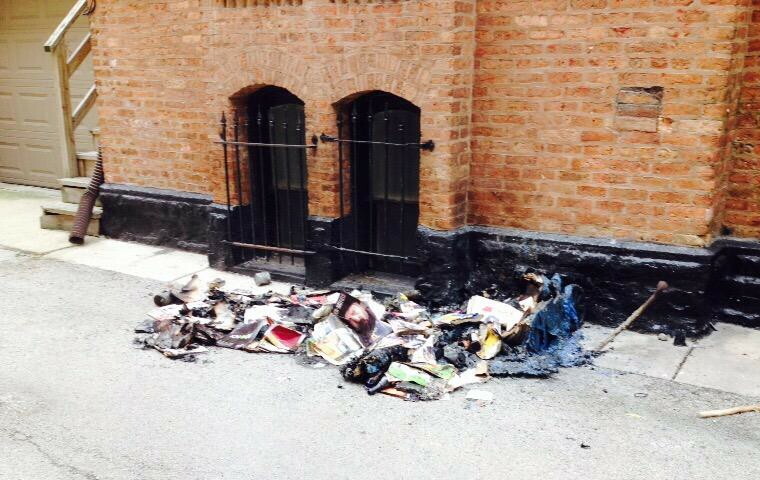 A series of unusual overnight alley fires has been reported in Lakeview and Lincoln Park this summer. Some have been quite sizable. Image: Remnants of a trash can fire at Wrightwood and Lehmann Court from our friends at Hey Jackass! Want to support CWB's efforts? Visit our company store for "Helmont" CTA-themed shirts, advertising opportunities, and our much-appreciated Tip Jar.